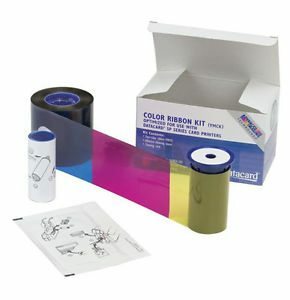 Evolis YMCKO ribbons are used for printing a combination of full-color images and one-color text or barcodes. 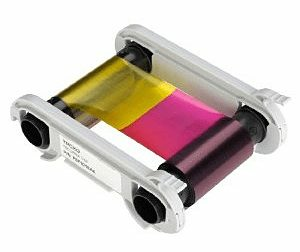 Evolis YMCKO ribbons consist of yellow (Y), magenta (M) and cyan (C) panels for printing a full spectrum of colors by combining the colors using varying degrees of heat. The K panel is a black resin panel, typically used for printing text and barcodes and the O panel is a thin, clear protective overlay that is applied over the entire surface of your cards. Evolis ribbons are specially back-coated to extend printhead life. Higgins is an authorized Evolis dealer. The item you are viewing is a genuine Evolis item and not a generic or imitation ribbons. Using non-Evolis certified supplies can void your printer’s warranty.